Today, Bennett had his first dental appointment. It wasn’t his first visit as he has been present for all of Jeffrey’s check-ups and several of mine. Jeffrey had an appointment at 11am today, and when we first got there, Bennett was excited and happy. 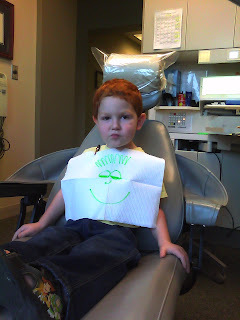 Then Miss Julie (our hygienist) asked him if he was going to let her count his teeth later. Apparently, the answer to that was NO. He spent the rest of the Jeffrey’s visit standing with his face pressed against the hallway wall opposite the exam cubby. No, he wasn’t in trouble. I don’t do time-out. He just didn’t want anyone to talk to him and apparently he’s still in the “If I can’t see you, you can’t see me” stage. Of course, several staff members tried to talk to him, but he was having none of that. He was not at all sure about all this at first. We promised him it wouldn’t. It was supposed to be just a “get to know you” visit, but once he got settled in, he did so well that she went ahead and cleaned his teeth. 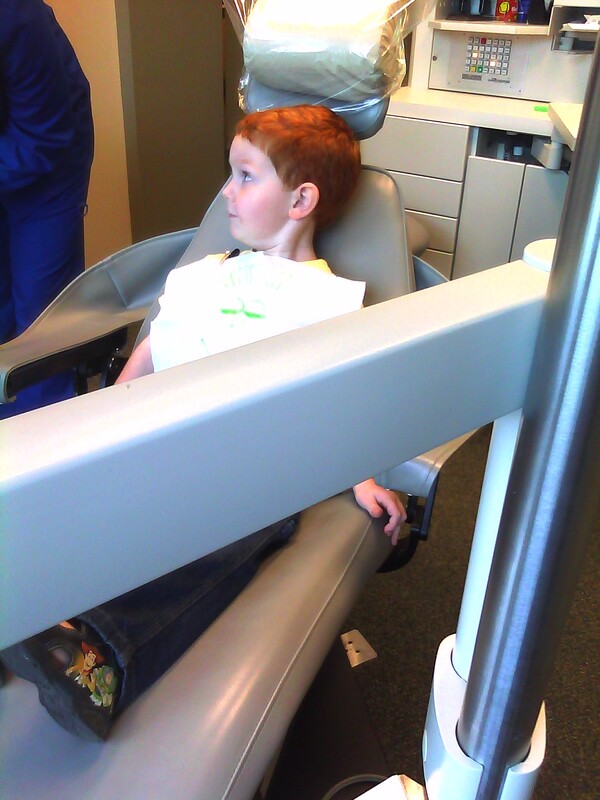 Julie asked him if he still let Mama help him brush his teeth. He said yes, and Jeffrey piped up and said, “I help him, too!” Bennett said, “Jeppy, too.” Then he exclaimed proudly, “I pee all by myself!” Because apparently, when you’re three, everything you do in the bathroom is connected.